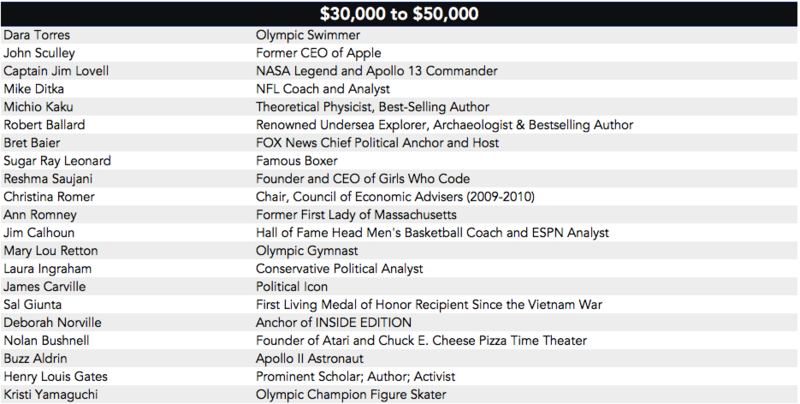 Why Do Famous People Get Paid $250,000 to Give a Speech? In 2013 and 2014, Goldman Sachs, Morgan Stanley, and Deutsche Bank each paid Hillary Clinton $225,000 to give a speech. “If you're going to give a speech for $225,000, it must be a hell of a good speech," Bernie Sanders said of Clinton’s speaking fees when he ran for president. Sanders was insinuating that bankers had bought Clinton’s loyalty. After all, how could a speech be worth $225,000? But that’s like asking why anyone would pay Beyoncé or the Beatles a million dollars just to play a few songs. 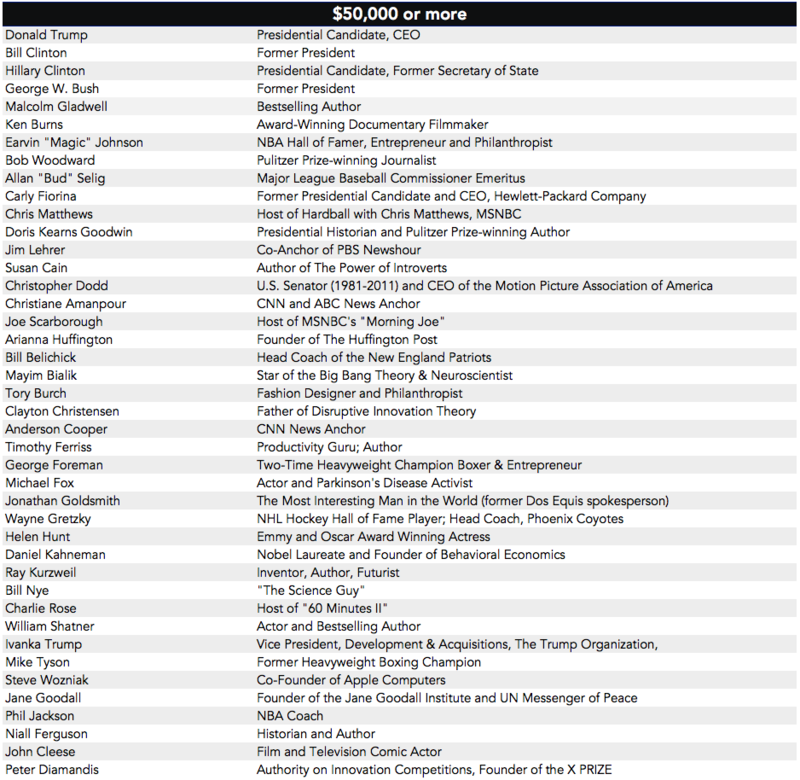 Organizations routinely pay huge sums to have famous people say a few words or attend a conference. Paid speeches are how politicians profit when they leave office and how book authors make good money. It’s a safe bet that Rio Olympians are working with speech coaches right now. Fees are gathered mainly from the websites of speaking agencies. Some fee ranges may be outdated or inflated. Selecting for speakers based on fame exaggerates the high end of the market (most speakers are lesser known business gurus or motivational speakers whose fee is under $20,000) and skews the list of speakers to be more male than it otherwise would be (largely due to the larger number of male athletes). 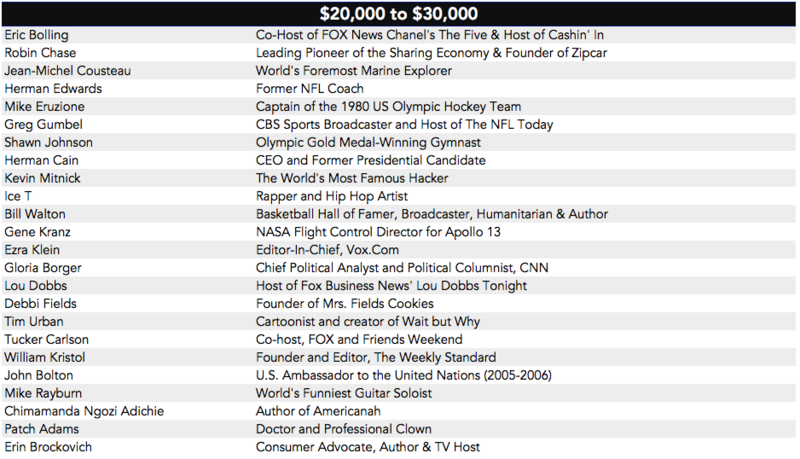 Anderson Cooper, Malcolm Gladwell, and co. don’t charge this much every time they speak. They make exceptions for high schools and, often, for commencement addresses. (Students and administrators tend to choose speakers with a personal connection to the college.) And a minority donate all their speaking fees to charity. But people with a great story, a famous name, or business acumen can profit enormously by flying to San Francisco for a Salesforce conference. Or to Orlando for the National Association of Realtors Conference and Expo. 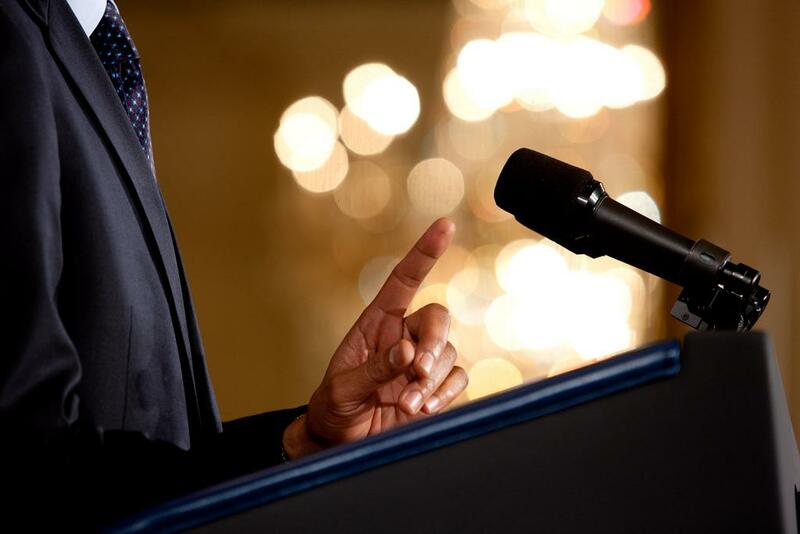 It’s all part of an industry of agencies that represent big-name speakers and connect them with event organizers—usually of corporate conferences—willing to pay $10,000 to $1 million for a good speech. The industry offers speakers a means to share a message or promote a book, and, above all, turn fame into money. People have always had a complex about speeches. But for people who excel at giving speeches, the rewards have always been great. In Ancient Rome, Cicero’s great oratory made him one of the most powerful people in the world. More recently, Barack Obama’s 2004 Democratic Convention keynote about “the audacity of hope” made him an overnight star. According to Bloomberg, Gerald Ford became the first former president to give paid speeches in 1977. His $25,000 appearances went largely unnoticed; the New York Times archives has no mention of them. But when Ronald Reagan gave many prominent, paid speeches in his retirement, he boosted the industry and cemented the current tradition of politicians, who are banned from giving paid speeches, cashing in once they leave office. Lucrative speaking appearances, however, are not a modern invention. They’re 150 years old. The practice arose in pre-Civil War New England in response to Bostonians’ clamor to hear lectures by abolitionists like Henry Ward Beecher. A literary man named James Redpath began acting as matchmaker between anti-slavery orators and interested audiences; soon he was a de facto agent, organizing speaking tours for famous Americans. The result was America’s “Lyceum Movement.” The speakers broadened their scope to address the arts, politics, and science, and the Lyceum Movement became known as “the people’s college.” Mark Twain read his literary work; Abraham Lincoln warned of the corrupting influences of slavery; and Elizabeth Cady Stanton lectured on the importance of women’s suffrage. "The lyceum invaded the cities and towns of the country,” The American Educational Reviewobserved in 1910, “and during these years, its apostles have been heard in school, in church, [and] wherever sufficient numbers could be banded together to warrant bringing to their town the great and the near-great." A subsequent movement called Chautauqua organized speaking events around the country—with equal success—in the early 1900s. It wasn’t cheap to get Ralph Waldo Emerson to come talk about self-reliance. He charged $300, apparently setting a high price so he’d never be asked to speak in small markets like Cincinnati. “We found after a few years,” a Lyceum organizer wrote, “that the drift was quite toward making the lyceum a money-making affair, without regard to any higher end." The lecture circuit became the primary way intellectuals supported themselves. Susan B. Anthony gave up to 100 speeches a year to fund her activism, and Mark Twain organized lecture tours with entrepreneurial zeal. Lyceum fees ranged from $50 for a popular instructor in a small town to several hundred dollars (or up to $1,000 in New York City) for luminaries like Frederick Douglass. Adjusting for inflation, this means big-name speakers in 19th century America earned $10,000 to $25,000 on the lecture circuit. A $40,000 speech is a lot less puzzling when you think of it like a concert. If an event organizer sells out a 6,000-seat auditorium, a $10 ticket should more than cover the costs. 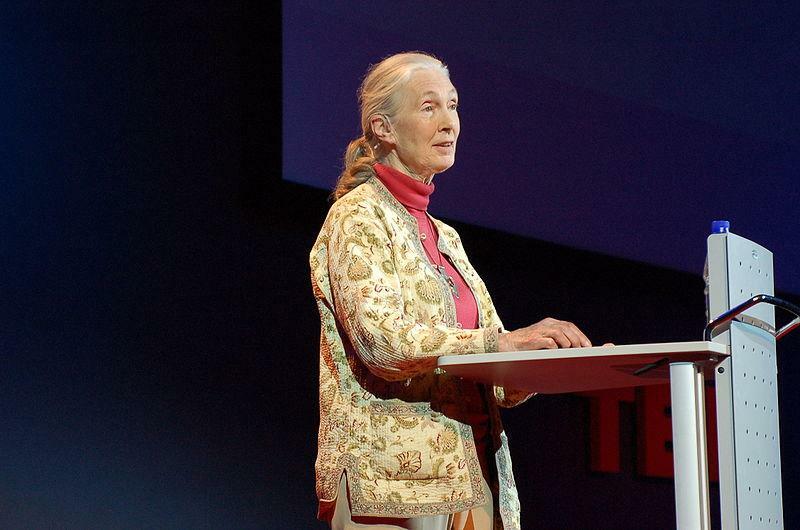 For speakers like Malcolm Gladwell and Jane Goodall, ticketed events hosted by universities, libraries, local Chambers of Commerce, and theatrical promoters make up part of the lecture circuit. But the growth of the speakers industry since the 1970s—and the existence of six-figure speaking fees for people like Hillary Clinton—relies on the logic of hiring celebrities to speak at corporate events. The rewards to attracting the right people in the corporate world can more than justify a six-figure speech. Hedge funds often invite potential clients to events featuring prominent speakers. As one hedge fund manager has explained, if just one client “decides to invest $10 million… the firm will snag a 2 percent management fee—which works out to $200,000” per year. For companies like Google and Goldman Sachs, hiring a famous speaker to address their employees is a perk like free lunch. But professional associations are a more common employer of highly paid speakers. Hillary Clinton, for example, did not just speak at Morgan Stanley. She was hired by the National Association of Realtors, International Deli-Dairy-Bakery Association, American Society of Travel Agents, American Camping Association, and Institute of Scrap Recycling Industries. And they each paid her nearly a quarter of a million dollars. 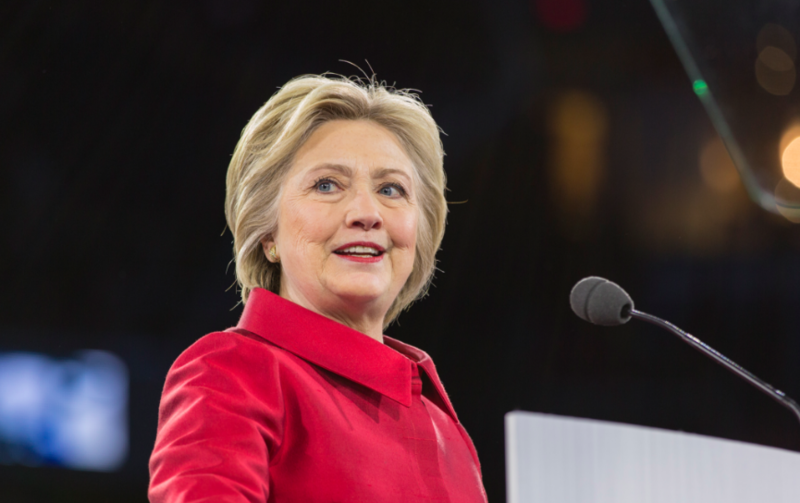 Why did a bunch of recyclers pay Hillary Clinton $225,000 for a speech? Because they know famous speakers attract a crowd. “We’ve essentially had every former president since Ronald Reagan,” says Chuck Carr, the Vice President for Convention, Education & Training at the Institute of Scrap Recycling Industries (ISRI), “and most of the secretaries of state.” As a professional association, ISRI not only wants to sell tickets to its annual conference. It wants good attendance from recycling professionals so they benefit from the networking opportunities. And people like Stanley McChrystal and Bill Clinton help them do that. 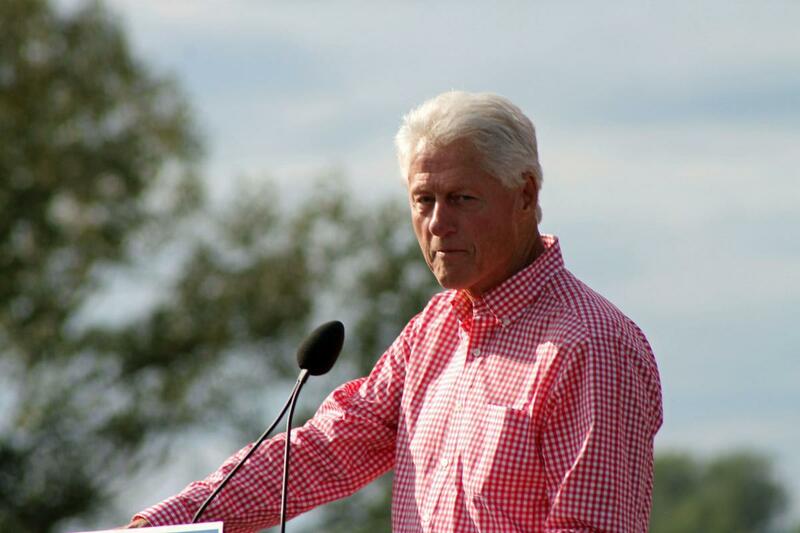 At some conferences, speeches by authors and former presidents are highbrow entertainment, slotted into the schedule like a performance by Green Day. At a gathering of the American Camping Association, Hillary Clinton discussed her career and only addressed camping by joking that Congress might benefit from attending a bipartisan summer camp. But highly paid speeches are not always pure entertainment. This once meant companies wanted to hear from Republicans and Democrats. Polarization, however, has hit the speakers industry. “Now if you bring in a Republican or Democrat,” Keppler says, “all you do is piss off 50% of the audience.” It’s safer to hire an Apollo 13 astronaut for an inspirational speech. The current trend, Keppler says, is speakers who can talk about how to create a better company culture, improve an organization’s leadership, or stand out in a crowded market. In the case of politicians like Hillary Clinton, many observers see a more sinister explanation for how a speech can be worth $225,000: the speech is buying political influence. This concern isn’t unique to politicians. The Columbia Journalism Review has questioned whether reporters who cover Wall Street should accept $20,000 speaking gigs from big banks, and Nate Silver raised eyebrows this week by giving a paid, closed-door presentation to Republican donors. It’s this concern that motivates the law that active politicians can’t give paid speeches, and most newspapers ban their beat reporters from getting paid to talk. It’s impossible to say exactly how much the desire to influence politicians inflates their speaking fees. Critics tend to ask why anyone would pay Hillary Clinton, who acknowledges that she is “not a natural politician,” $225,000 for a speech. But speaking agents say that her status as one of the most famous people in the world justifies her fee, and a one-time speech is a poor way to get quid pro quo. Instead, certain organizations likely view paying a politician’s speaking fee the same way they view contributing money to his or her campaign: part of a larger lobbying effort. Earning $40,000 for a speech sounds like easy money. But the reality is that the speaking circuit can be grueling. Even veterans of countless press conferences find themselves working with coaches like Mary Gardner. “I’ve told some famous people, ‘Stop! Stop! You’re boring me to tears,’” says Gardner, who will fly cross-country to drill speakers in a hotel room. Especially for athletes who previously spent all their time practicing jump shots or a floor routine, launching a career takes time. Gardner coaches her clients on how to stand confidently and even to tilt their head the right way when meeting fans. But even after a retired politician, former athlete, or prominent executive has earned a reputation for speaking, many will still turn down the majority of offers. Because while a speech seems like easy money, it’s really not. In 1895, a speaking agent said of Susan B. Anthony, she “has done more lecturing than any other person in America, and survived it.” Speakers no longer jump off moving trains to make it to a conference. But it’s still a lonely travel schedule. Like a political campaign, a speaking tour involves unglamorous travel and repetitive events. But just as campaigns create occasional moments of genuine candidate-voter connection and inspiring events like Barack Obama’s acceptance of the presidency in 2008, the speaking industry can remind listeners that public figures are normal people and give them chills when an Apollo 13 astronaut recalls an oxygen tank exploding. People will pay a lot for those moments. Even if it costs tens of thousands of dollars, people want to bask in the halo of fame and accomplishment. Our next article explores whether the father of modern statistics was a shill for Big Tobacco. To get notified when we post it → join our email list.